DETROIT, March 30, 2018 /PRNewswire/ -- DTE Energy has submitted its 2018 Renewable Energy Plan to the Michigan Public Service Commission (MPSC) proposing approximately 1,000 additional megawatts of carbon-free electricity from new wind and solar projects in Michigan scheduled to be completed by 2022. If approved, these new renewable energy projects would drive investment of more than $1.7 billion in Michigan and double DTE's renewable energy capacity from 1,000 megawatts to 2,000 megawatts – enough clean energy to power over 800,000 homes. The filing outlines DTE's approach to Michigan's 15 percent Renewable Portfolio Standard (RPS) as well as its intent to offer a new voluntary renewable energy program specifically designed for large business customers seeking to reduce carbon emissions. This program will provide additional renewable resources beyond those proposed to meet the 15 percent RPS requirement and differs from DTE's MIGreenPower voluntary program. The plan also includes the launch of a pilot program for battery storage technology aimed at improving the reliability of energy provided from wind and solar power. "The plan we have filed takes another significant next step toward our goal of cutting carbon emissions by more than 80 percent by 2050 while continuing to deliver reliable and affordable power for our 2.2 million customers," DTE Energy Chairman and CEO Gerry Anderson said. 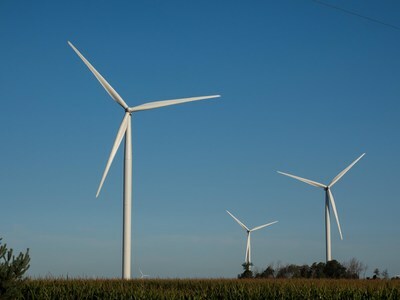 "Due to our substantial investments and use of renewable energy, DTE has already reduced its carbon emissions by nearly 25 percent by driving investments of approximately $2.5 billion over the last 10 years in Michigan's renewable energy sector and adding 1,000 megawatts of wind and solar capacity – enough clean energy to power more than 450,000 homes." Bringing online the Pine River wind park later this year, and the Polaris wind park in 2019. Together, the parks will have the capability of generating 330 megawatts and will be DTE's largest and most efficient wind parks to date. Adding 300 megawatts of new wind capacity in 2020 to supply a new voluntary renewable energy program for large customers seeking to reduce carbon emissions. Building two additional wind parks that will provide a combined 375 megawatts and begin operation in 2021 and 2022. Installing approximately 15 megawatts of new Michigan-based solar capacity over the next three years, increasing DTE's solar capacity by almost 25 percent over the next three years. "Beyond this plan, DTE will continue to add additional renewable energy resources," Anderson said. "Reducing our company's carbon emissions and developing cleaner sources of energy is a key priority for us. This work will also bring positive economic impacts such as job creation and local community revenue." DTE studied the engineering and the economics of Michigan's energy future for two years before announcing last year its initiative to reduce carbon emissions by more than 80 percent by 2050 – a timeframe that aligns with what scientists broadly have identified as necessary to help address climate change. "We've concluded not only that the 80 percent reduction goal is achievable, it is achievable in a way that ensures Michigan's power is safe, secure, affordable, reliable – and sustainable," Anderson said. "There doesn't have to be a choice between a healthy environment and a healthy economy, although the debate often gets framed that way. We can have both, if we invest in a smart way." By continuing to incorporate substantially more renewable energy, transitioning its 24/7 power sources from coal to natural gas, operating its zero-emission Fermi 2 power plant, and improving options for customers to save energy and reduce bills, DTE plans to reduce carbon emissions by 45 percent by 2030, and 75 percent by 2040 on the way to its ultimate goal in 2050. These plans define a long-term shift by DTE to produce over three-quarters of its power from renewable energy and highly efficient natural gas-fired power plants. DTE's 2018 Renewable Energy Plan significantly contributes to the company's efforts to implement Michigan's energy transition. In December 2016, bi-partisan energy legislation was passed to address the state's transition of energy generation sources and ensure reliable, safe and cleaner electricity for the state. Turbines at DTE's Pinnebog wind park located in Huron County, Michigan.